Zeresenay Berhane Mehari, who wrote and directed his award winning film, DIFRET, 2014 was determined to shoot on 35mm film, despite having nearly no budget and enormous logistical difficulties. He knew his story needed the poetic texture and depth that only film could give him because of the many contrasts in the story, between the urban cityscape of Addis Ababa and the rural landscapes of the village, between the youth and age of his characters, and between tradition and modernity. With help from Panavision and a Kickstarter Campaign, he shot on location in Ethiopia where there were no labs and had to ship the dailies to India. He became only the fourth film director ever to succeed in shooting his film on 35mm in Ethiopia. The astounding success DIFRET has had vindicates all his decisions. It has won the Audience Awards at Sundance and Berlin International Film Festivals this year because audiences can feel the passion, emotion and rigor in the film: the medium carried the content perfectly because the story is, quite simply, beautifully told. 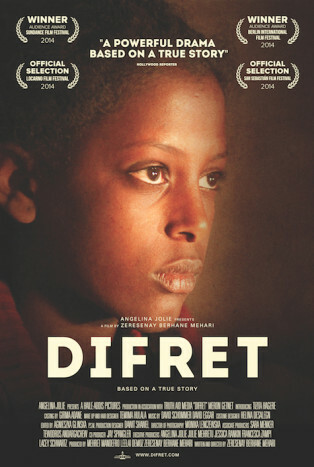 DIFRET is based on a true story about advancing women’s rights in Ethiopia. It is about Meaza Ashenafi, the founder of the Ethiopian Women’s Lawyers Association, and her legal fight in the 1990s to protect a young girl who had been abducted by the customary practice of ‘telefa’ – the abduction of child brides. Shot in the native language of Amharic and using actors from the local industry, the production lasted 34 days, shooting 6 days a week and on average 14 hours a day using 71 actors with speaking roles, 300 extras, and numerous horses, donkeys, and sheep. DIFRET is uniquely positioned to sow the seeds of change in Ethiopia: its local production, its sensitivity to local nuance and its use of Amharic all promote a sense of ownership and accessibility to Ethiopians. Now the hope is to screen the film in the fourteen provinces where child bride abduction is most prevalent. Only those at the center of the practice of telefa can affect true transformation, and the aim is to encourage these individuals to embrace a change that will brighten the future of many women in Ethiopia.